They said it - I didn't. Regardless of the law, they will import you a car. Perhaps they were looking for a different word ? Or perhaps it was a Freudian slip. They say in here, they can take a street car, put a cage and seats in it, and make it into a race car. 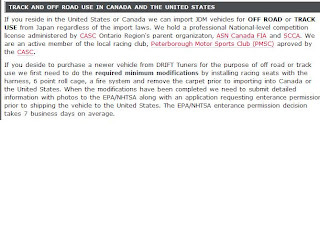 Are they sure they are not trying to import the cars temporarily. Then telling people its permanent. Whos going to be liable for the bond in a year, when the temporary bond is up ? Apply to NHTSA for a letter granting you permission to import the vehicle on a temporary basis. For that purpose, you should use the application form posted on this website. File with Customs, upon entry, an HS-7 Declaration form on which Box 7 is checked, indicating that the motor vehicle does not comply with all applicable Federal Motor Vehicle Safety, Bumper, and Theft Prevention Standards, but is being imported solely for the purpose of competitive racing events. Attach a copy of the NHTSA permission letter to the HS-7 Declaration form that you furnish to Customs. 1. Importer’s name, address, and daytime phone number. 2. Customs broker’s name, contact, and phone number. 3. Vehicle information (make, model, model year, and VIN or identifying number). 4. A list of the racing features of the vehicle. 5. A list of the features lacking that are needed for use of the vehicle on public roads. 6. Photographs showing the following views: front, rear, side, and interior. Racing features and/or features lacking for on-road use on public roads should be shown in the photographs. 7. The name of the sanctioning body and competition class. 8. Previous race history of the vehicle (if any). 9. Schedule of racing events, including dates and locations where vehicle will compete (if any). 10. Copy of the competition-racing license of the importer (if any). Permission to import a motor vehicle temporarily is granted in annual increments for up to three years if duty is not paid, or for up to five years if duty is paid. No later than 30 days after the expiration of the period for which permission is granted, the vehicle must be either exported from the United States or destroyed.